This Sunday we start up a new cycle of membership classes at our church, what we call Discover OBC. 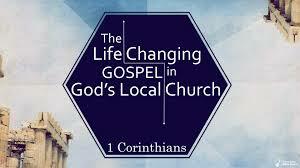 And in our first part we look at the Gospel and the Church. I love teaching about these two subjects, because they are at the core of Christianity. The gospel is the message which brings hope to a sinful world; the church is the community created by that gospel and commissioned to protect and proclaim that gospel so that the whole world might hear of King Jesus. I love the gospel and the church, and I can’t wait to teach about them Sunday. But it wasn’t always that way. Admittedly, for me, I was slow to understand and appreciate the importance and beauty of the local church. In high school and college, I came to faith, began sharing the gospel, and learning how the Word of God impacted all of life. In this time, church was important, but only as an extension of my individual Christianity. For me church was an a la carte affair. I was committed to worshiping on Sunday, but not to any particular church. As long as I heard the Bible somewhere, that was enough. I was committed to evangelism and discipleship, but I did not see them as necessarily connected to the local church. As long as the gospel was going forward, surely that was enough. Right? What did the local church matter? Well, near the end of college I “sensed the need” to join a church. I didn’t have any biblical reasons for the desire; it was just something I felt. (N.B. I am glad for this decision, but I don’t think it is the way the Bible teaches us to make decisions). After five years of walking with Jesus, I moved across the country to join a Bible-teaching, elder-led local church. And “attach” is probably the right term, because I still conceived of the church as the place individuals attach themselves to one another, more than a covenant community created by Jesus and bound by his Spirit. As I look back, I realize how much I conceived of the church and Christianity in radically individualistic ways. I had come to believe the gospel, but the operating system of my life was still the expressive individualism I inherited from my culture. Not surprisingly, this is how I approached church. Even after joining the church, I still approached church this way. It wasn’t until I began to study the Scriptures on the matter, that I began to see that the Bible was and is at odds with the individualistic Christianity that I first adopted. Most helpful to me in understanding what the Bible says about church were the many metaphors Scripture gives to us about the church. For instance, 1 Timothy 3:15 says we are God’s household; 1 Corinthians 12 calls us the body of Christ; Ephesians 5 likens us to Christ’s bride; 1 Corinthians 3:16; 6:19 describes us as God’s temple; Ephesians 2:19–22 says the same thing; and 1 Peter 2:5, 9 adds that each of us are living stones in that temple. I have written about these things before and will cover them in our new members class, but today I want to suggest four others word-pictures that might help you and I think about what church is and isn’t. First, the church is a family home not a spiritual hotel. That is, the church is not an amenity-filled temporary residence; it is meant to be a long-term, family-filled gathering place where we do life together. While our culture teaches us to be consumers, a church based on God’s Word teaches us to be brothers and sisters. Second, the church is a military outpost, not an earthly resort. While there is a place for retreat and rest, the church is a royal embassy engaged in spiritual warfare. Therefore, we come to church not just to escape, but to be equipped and to work together to proclaim the gospel of the kingdom to a hostile world. Third, the church is a heavenly practice, not an earthly pit-stop. On a long journey, rest is needed. But if we treat church as merely the rest on our journey, we miss that church is actually the goal, not the pit stop we take on the way to something else. More accurately, gathering to worship and fellowship is the way we practice our everlasting life. It is not given to merely assist us in earthly labors; it is meant to subvert earthly labors as it teaches us to store up treasures in heaven. In this vein, God may be calling you to use your gifts to build up the body of Christ, imperfect as it is, rather than using your GPS to find the service that best meets all our needs. But to embrace that we must remember the church is not yet perfect. Fourth, the local church is a temporary shadow, not the full and final substance. How often do we complain (if only in our hearts) that church is not like we want it? In truth, this is how it will always be. Until all of God’s people, from all ages and all places, are gathered around the throne room, we will experience the thorns and thistles of this age—even in the church. Therefore, it may help to remember that our local assemblies are but grace-filled shadows of God’s ultimate goal—a new creation filled with resurrected saints. Indeed, these kinds of word-pictures have helped me think more clearly about the biblical picture of the church. Based on the metaphors of Scripture, they have enlarged my heart for the church—in all of its grace and grit. A gospel-centered church is truly a beautiful creation. I pray these images will help you see its beauty and mission as well.